3 What is a Charrette? International architects and planners are invited to join Cuban experts and local communities for a one week Charrette 29 March - 4 April 2009 to develop ideas for the development of the waterfront sector of the Old Havana Harbor, and for Casablanca, a small marine town across from Old Havana with 5,000 inhabitants, founded in 1780. Elaborate ideas for the development of the waterfront sector of both The Harbor and Casablanca. 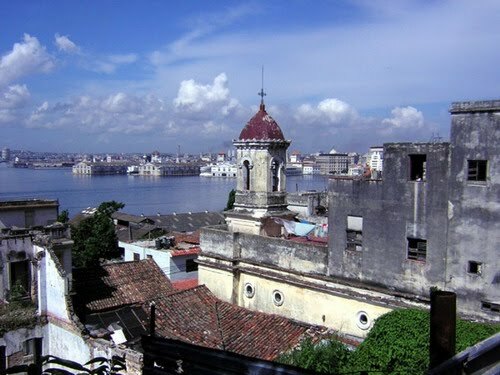 Promote and highlight the importance of the harbor for the new image of Havana and for social and cultural integration. Evaluate the benefits of the transformation of the Harbor for the future of Havana in economical and urban terms. Improve the quality of life of the inhabitants of Casablanca, preserving its Mediterranean image and getting advantage of its privilege site. Propose the increase of urban open space, housing and commerce in the area and its impact at city level. 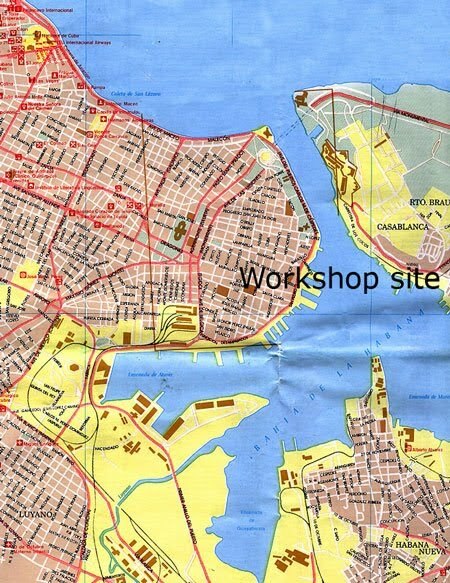 Turn the current industrial character of the harbor into a sport and recreation one. Reshape the urban landscape of an area currently dilapidated and lacking character and identity increasing the green areas. Reinforce the cultural identity of the City of Havana. Propose the sanitation of the bay as a necessary condition and departure point to achieve from an ecological perspective. Day 1 Sunday March 29th. Early evening 17.00 or 18.00. Public Meeting. Welcome and Introduction by Dr. Eusebio Leal Spengler Director of the Office of the Historian of the City of Havana or one of his team members followed by a buffet and drinks (mojitos). Day 2 Monday March 30th. Morning. Work Session. Tour of the harbor site and lecture about the city, its history and evolution by Prof. Julio Cesar. Lunch at La Divina Pastora Restaurant by one of the most important fortresses on the bay. Afternoon Session. Day 3 Tuesday March 31st. Morning 9.30. Public meeting and pin ups of the first ideas. Several speakers. Coordinator Prof. Arch. Julio César Pérez. Day 4 Wednesday April 1st. Morning. 9.30. Studio work: Casablanca and the harbour. Day 5 Thursday April 2nd. Morning. 9.30. Day 6 Friday April 3rd. Morning. 9.30. Day 7 Saturday April 4th. Morning. 9.30. In 2007 and 2008 the Royal Norwegian Embassy has most generously invited all Charrette participants to a private evening reception with dinner and live music at the residence of the Norwegian Charge d'Affairs. In 2008 also the British Embassy invited some of the Charrette participants to a private evening reception at the residence of the British Ambassador. We are working on arranging for similar events for the participants of the 2009 Charrette, although these events depend entirely on the respective embassies. Read more about it at The Town Paper and Wikipedia. In 2007 and 2008 participation at the Charrette was free of charge. But this year due to the financial crisis we have not been able to secure all the necessary private sponsorship to cover the expenses for the Charrette. So we would kindly ask all international participants to contribute with CUC 350 each. This fee goes exclusively to expenses during the Charrette, such as some basic materials, transportation costs for Cuban participants, rent of venue, etc. No-one gets paid for participation or organization at the event, and the organizers still sponsor a large part of the expenses of the Charrette with their private funds. This is a purely not-for-profit event. Students are of course welcome to participate free of charge. The participants will have to organize their own travel to and from Cuba, and cover accomodation and meals individually. We can arrange accomodation for 55 USD (50 Cuban Convertible Peso) per night on request. This price is per room, single or double occupancy. Most of our participants at the 2007 and 2008 Charrettes chose to accept this offer, although some preferred to arrange for their own accommodation. If you prefer hotel accommodation, we can arrange this for you at a cost of 140 CUC per night at the historical Hotel Nacional. For registration for the charrette, or if you have any more questions, please e-mail Claus Zapffe. You will need a visa for visiting Cuba, please contact your local Cuban embassy. A tourist visa should be the simplest one to obtain. New regulations require you to provide the address and registration number of our Casa Particular when applying for a visa. We will provide you with this information in due time if you decide to let us arrange for your accomodation. We have had American participants on both our tour and workshop in 2007 and 2008. But due to the American trade embargo, American citizens wanting to travel to Cuba will need to travel under either a general or a specific license. Please see the following website at the United States Department of the Treasury Office of Foreign Assets Control. Each participant is for himself responsible to decide whether the conditions of the general license applies to him, as the penalties for breaking the embargo are quite serious. Please e-mail Claus Zapffe or contact the travel agent below if you are in doubt. Ines Travel - 4470 SW Hall Blvd # B, Beaverton - (503) 641-8708. If you are uncertain about whether or not you fall under the General License category, you may contact the Center for Constitutional Rights in New York (Phone: 212-614-6464; Fax: 212-614-6499; Email: ccr@igc.apc.org ), for free legal advice on travel regulations. One of our previous participant from the US has been to Cuba many times. He writes: "You asked me to write you about paperwork needed for permission to travel to Cuba. I'm a registered architect practicing in the US, and I teach studios and courses at a US architecture school. I have been working together with a professor on Cuba for 8 years now. As part of my preparation, I create a calendar of the work I intend to do each day, and I set specific goals for myself as to the particular parts of Cuban architecture and culture I intend to study. In the case of the charrette conducted by Audun, Claus, and Julio Cesar, the schedule of work is clearly mapped out. I can assure you there's not a lot of spare time for those days. As for your independent study before the Charrette starts, I suggest you put your goals for the districts or buildings you wish to study in a list, and then keep some notes about your observations. Should you get any questions when either leaving or entering the U.S. as part of the trip, you'll have your record to share." The charrette is formally organised by C.E.U. Norway - Council of European Urbanism. We have a strong history of organising similar events in other countries, including Norway, Germany, the UK, Romania and Italy. In September 2008 C.E.U. Norway organised the Third International C.E.U. Congress - Climate Change and Urban Design in Oslo, Norway. Loeb Fellow at Harvard Graduate School of Design 2001-2002 and adjunct professor at the School of Architecture in Havana (1998-2006), has lectured widely in the US, Canada and Europe about Cuban architecture. He is a member of the Union of Writers and Artists of Cuba and the recipient of several international and national awards. His writings have been published in the New York Times, Arquitectura Cuba and Arquitectura y Urbanismo. Julio Cesar Perez is the author of a major new book on Cuban architecture and culture, "Inside Cuba", published by Taschen. He is the President of the Cuban Chapter of the C.E.U. and the author of "A Master plan for 21st century Havana". Cick here for a complete CV. John H. Pilling, AIA - instructor at the Boston Architectural College since 1993. His studios, which focus on cities of Mexico and the Caribbean, have been done with the friendship of the Faculties of Architecture at CUJAE in Havana and campuses of Tec. de Monterrey (ITESM) in Guadalajara and Mexico City. He has traveled regularly to Cuba since 2001 to do research on its architecture and urban design. In addition to his academic work he practices full time in metropolitan Boston. Oslo, Norway. Education in law, project manager for the Norwegian Foundation for Urban Renewal, an INTBAU (Internationl Network for Traditional Building, Architecture and Urbanism) partner organization. Member of the INTBAU Management Committee. Board member of CEU - Council for European Urbanism. Management Group Member of ESUA - European School for Urbanism and Architecture. Oslo, Norway. Consulting architect with own practice in Oslo, Norway and Bucharest, Romania. Management Group Member of ESUA - European School for Urbanism and Architecture. Board member of C.E.U. Norway and INTBAU Scandinavia. Project manager for the Norwegian Association for Adult Learning - Fjellregionen. Above: Casablanca with Havana in the background. Photo: Julio Cesar Perez. Declaration of Havana from a previous external workshop. Cuba is the biggest island in the Caribbean with 114, 525 Km2 and its current population is 11, 224, 321 inhabitants. Its strategic location regarding the Gulf of Mexico and the Strait of Florida marked important commercial routes since the arrival of the Europeans to America in 1492 while its tropical climate and the beauty of its beaches make it an important destination for tourists nowadays. Havana is the Capital of Cuba and it was founded by its protected harbor in 1519 whose key geographic position for the Spanish fleets granted the city great prominence by the XVI century. Partially surrounded by a chain of stone fortresses that were built to defend the city, the harbor has an enormous potential for its future economic and urban transformation as part of the waterfront redevelopment strategy to increase public space, housing, recreation and commerce. Its current population is around 2.5 million people. There are different towns and neighborhoods - like Regla, Guanabacoa and Casablanca - around the harbor. Read more about Havana on Wikipedia. 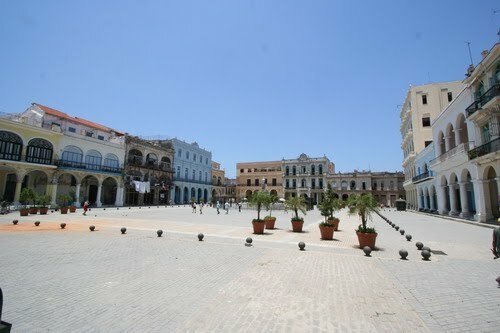 Casablanca, founded in 1780, is a small marine town across from Old Havana with 5,000 inhabitants. It is crowned by the biggest fortress built by Spain in America from 1763 to 1774. The town is located on a hill where the bay becomes wider so it offers magnificent views to the bay and Old Havana and the Malecón- the seaside promenade in the background. Its urban pattern is very simple and mostly developed along a main axis- Calle Artés- parallel to the water and then, terraces that deal with the slope of the site to accommodate other streets and the buildings. The European influenced vernacular architecture is rather simple and most of the buildings are one story high row houses either with flat or pitched roofs. Porches, high ceilings, stucco walls and courtyards are among its main features. Infrastructure is in an acceptable condition- the town has a stable water supply, electricity, sewage and telephone network- though it should be improved. It has a train- the 1916 Hershey electrical train, the only one in Havana and the oldest of its kind still working in the world- and a boat service for transportation across the harbor. The 28 meters high Jesus Christ of Havana- a 1958 white Carrara marble sculpture by woman artist Jilma Madera- is one of the landmarks together with the National Weather Center and its dome and the Fortress of La Cabaña, where the International Book Fair is held every year. 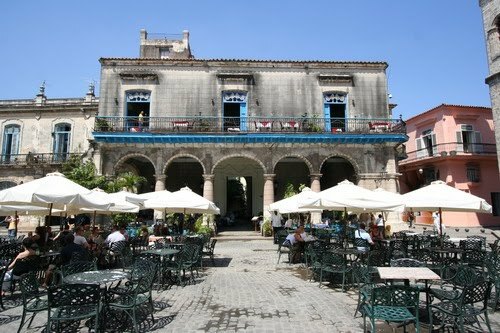 Providing the enormous success of restoration in Old Havana- declared a World Heritage Site by UNESCO in 1982- Casablanca- under the authority of the Historian of the City of Havana- could enjoy the benefits of restoration with a sustainable approach. Casablanca offers an opportunity to develop a project for improving the quality of life of its inhabitants and a challenge to reshape the neighborhood getting advantage of its privilege location overlooking the bay and Old Havana.